The final four teams are set and this Sunday will determine the two teams heading to Atlanta for Super Bowl LIII. 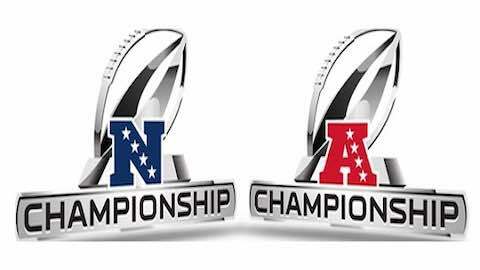 Here's a preview of the AFC and NFC Conference Championship Games. On Championship Sunday, the Super Bowl LIII participants will be decided. In the NFC, the Los Angeles Rams take on the New Orleans Saints (3:05 PM ET, FOX) while the New England Patriots travel to Arrowhead Stadium to face the Kansas City Chiefs (6:40 PM ET, CBS) in the AFC. The Conference Championships feature the four highest-scoring teams from the regular season for the first time in the Super Bowl era. The NEW ENGLAND PATRIOTS have reached the Super Bowl in each of the past two seasons. With a win against Kansas City on Sunday, the Patriots would join the BUFFALO BILLS (1990-93) and MIAMI DOLPHINS (1971-73) as the only teams in the Super Bowl era to appear in three consecutive Super Bowls. With victories by the No. 1 seeded KANSAS CITY CHIEFS (AFC) and No. 1 seeded NEW ORLEANS SAINTS (NFC) on Sunday, it would mark the 14th time since the NFL began seeding teams in 1975 that both top seeds faced off in the Super Bowl and the fifth time in the past six seasons (2013-15, 2017). With wins on Sunday by both the Chiefs and Saints, it would mark the fifth time since 1975 that consecutive seasons have featured a Super Bowl matchup of the No. 1 seeds. With a win, the KANSAS CITY CHIEFS can become the sixth consecutive No. 1 seed to represent the AFC in the Super Bowl, surpassing five consecutive Super Bowls featuring the AFC's No. 1 seed (1987-1991) for the longest streak by the conference since 1975. A victory by Kansas City would also mark the second time that either conference has had a streak of six consecutive seasons with a Super Bowl featuring their No. 1 seed since 1975 (NFC - six consecutive seasons from 1981-86). Kansas City quarterback PATRICK MAHOMES passed for 278 yards in his postseason debut last weekend and ranked second in passing yards (5,097) during the regular season. With a Chiefs victory against New England, Mahomes would become the fourth quarterback to pass for at least 5,000 yards and reach the Super Bowl in the same season. New Orleans quarterback DREW BREES passed for 301 yards with two touchdowns in the Saints' Divisional Playoffs win against Philadelphia. With 300 passing yards on Sunday, Brees would tie PEYTON MANNING (nine games) for the second-most playoff games with at least 300 passing yards. Los Angeles Rams running back TODD GURLEY rushed for 115 yards and a touchdown in the Rams' Divisional round victory against Dallas. Gurley, who has rushed for at least 100 yards in each of his first two postseason appearances, can join ARIAN FOSTER as the only players in postseason history to rush for at least 100 yards in each of their first three playoff games. New England running back JAMES WHITE had 15 receptions in the Divisional Playoffs, tied with DARREN SPROLES (January 14, 2012 with New Orleans) for the most receptions by a player in a single postseason game in the Super Bowl era. With at least 10 receptions on Sunday at Kansas City, White would become the fourth player in the Super Bowl era to record consecutive postseason games with at least 10 catches. Patriots running back SONY MICHEL rushed for 129 yards and three touchdowns in the team's Divisional Playoffs victory. With one rushing touchdown on Sunday, Michel can tie the postseason record for the most rushing touchdowns by a rookie. NFL Football: "NFL Conference Championships - What to Look For - 2019"